We now begin a return to more seasonable weather and work our way toward another warm weekend. First, though, the snow plows are once again deployed in the state of Maine, where another several inches of April snow came down Tuesday night. For most of us, the air has dried out nicely and it’s chilly once again. 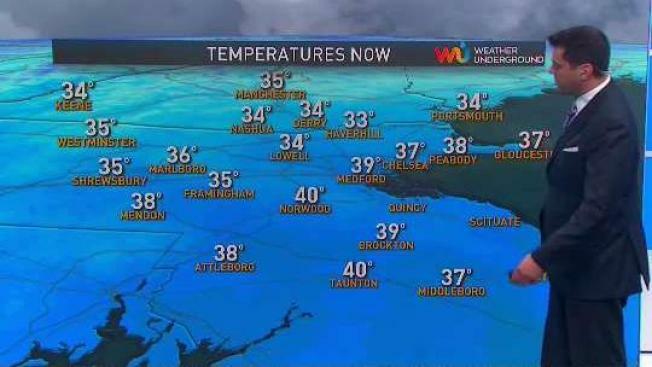 Temperatures are starting off in the 30s, and some 20s north. But with a good amount of sunshine in southern and western New England, we should recover to close to 50 degrees. In much of New Hampshire and especially Maine, there are still many clouds with mixed rain or snow showers that will taper during the afternoon. Wind is generally from the northwest at 10 to 15 mph. High pressure in southeastern Canada moves in Wednesday night with a mostly clear sky and a nice bright waxing moon. Low temperature will be in the 10s and 20s north, 20s and 30s south. Sunshine is in store for us Thursday and high temperature will be in the 50s for most. There’s a major storm crossing the nation, with a blizzard warning in much of the central Plains State, especially hard in South Dakota the next 48 hours. But it now looks like that storm is going to go so far west of us Friday night, that all we get is a period of rain mostly at night and a bunch of warmer air that pushes well ahead of that storm on a flow from the southwest. With fading sunshine Friday, we should be near 60 degrees. It looks like several hours of rain is possible Friday night with a slight chance of a thunderstorm followed by a clearing on Saturday. It may take a while for parts of New England, but by Saturday afternoon many of us should be near 70 degrees with a good amount of sunshine. Cooler and dry air moves in from southeastern Canada on Sunday, when it still looks mostly sunny and a high temperature closer to 60 degrees. Yet another system is going to race in here Sunday night, and likely track to our west. A warm front will likely generate a little wintry mix. That should go right to rain for most of us Sunday night. With a western shift to that storm's forecast track, Marathon Monday should be a little warmer than previously estimated, with rain more likely than snow and a high temperature in the 50s. Stay ahead of the weather with our first Alert 10-Day Forecast.